AVENUE who has partnered with Zenshi created a winter Fair Frost Fashion Show featuring designs across SL. 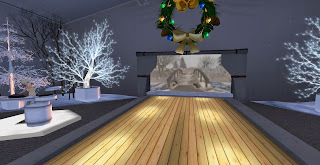 AVENUE is experienced in presenting and pulling off successful fashion shows, however, it was the First AVENUE-Zenshi Winter Fair Frost; A Zenshi's Catalogue Trunk Show. It was a nice touch to see the designers present watching the show along with the owner of Zenshi. The concept was to have each designer showing off one exclusive design, including other outfits for winter in their winter collection. The stage design was subtle and not very wintery and elaborate in creation compared to other fashion shows in the past. However, the snow falling was a nice touch. The actual show started off well but for me I found it a little hard to rezz with some of the grey models walking on the runway. However, once things rezzed the designs where not only creative but also very festive and fitting for a runway show. Gurk…. By AD Creations piece was amazing. It was an exclusive design by AD Creations, an avant-garde outfit made of the finest grey woollen fabric. The mid-rifted hoody features hand extensions of flowers and tulle while the high-waisted full length skirt has an apron band. 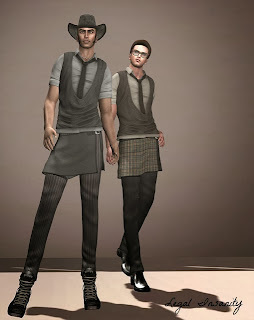 Tristan Pants and Kilt” from Legal Insanity was a trendy wintery outfit for men. It was a 1/4 length sleeved vest with loosened tie, modest kilt and jeans. Overall it was a nice fashion show. Clothing was as creative as you can imagine and also gave you an idea of what to expect in the stores now for winter. I will defiantly be looking for some of the clothing which featured on the runway to add to my winter wardrobe. Here are a few photos from the fashion show modelled by some of the models.